As explained in their pitch, the TAKTIK is an iPhone 4 and iPhone 4S case made from durable Ballistik polymer and high-quality aluminum materials. While the iPhone display is already covered with Gorilla Glass technology, this new case adds another layer of Gorilla Glass. This Gorilla Glass protective lens on the front bezel includes anti-glare and anti-smudge coating, according to the creators of the TAKTIK. Because water damage is a common issue for iPhone users, the case includes smart water-proofing technology over all of the iPhone’s external ports, even the speaker grill. The case is described as being a stylish version of an ultra protective iPhone case, as you can see in the video above. 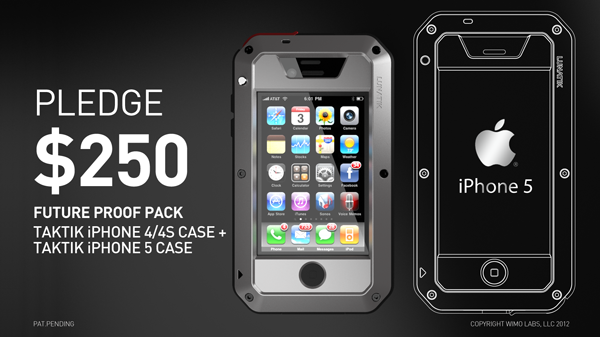 The company currently plans to ship the iPhone 4 and iPhone 4S cases to backers in August. Interestingly, the company is also promising a version of the case for the next-generation iPhone. Matching our photos of the device, the company seems to believe that the new iPhone will feature an overall taller form-factor and taller display. They say their cases for this new iPhone will be available during the holiday season.